Multiband limiting is a necessity for many modern styles. 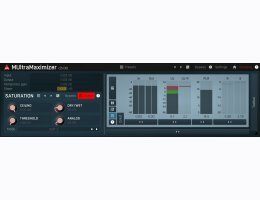 MUltraMaximizer is a powerful yet affordable solution for the loudness war! Turn the input gain up and see what happens! You will get more loudness, a flattened spectrum, and added warmth. All with just a few knobs. MUltraMaximizer features our magnificent saturation system, which can give pleasant analog character to your music and increase loudness.